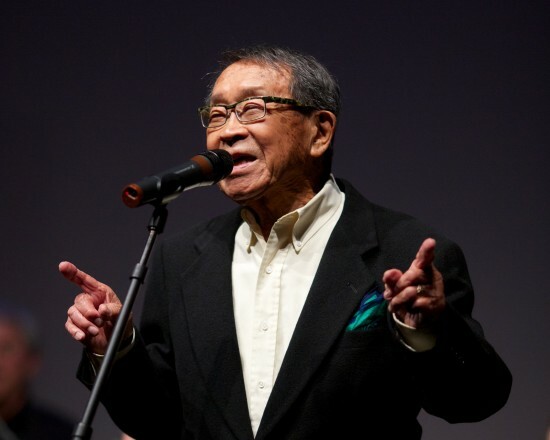 George Yoshida performing with the J-Town Jazz Ensemble at the celebration of Kimochi Home’s 30th anniversary on May 18, 2013 at the Sundance Kabuki Cinemas in San Francisco Japantown. A giant has fallen; not one of imposing stature, but a modest man whose enormous musical soul and heart-filled zest for life that touched people around the world has joined the ancestors. He stated, “In the camps, we identified ourselves as Americans through our music,” and it was his internment camp experience that shaped his destiny. After being released from camp, George went to Chicago, where he heard the Duke Ellington Orchestra performing on the South Side, a story he never tired of sharing. He married Helen Furuyama, started a family, settled in the East Bay and retired from the Berkeley Unified School District after over three decades as a public school teacher. 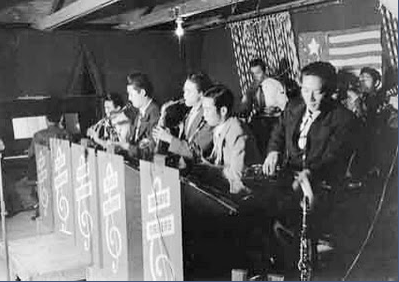 George Yoshida (second from left) playing saxophone with the Music Makers at Poston Camp 1 in 1942. In the early 1980s, Mark Izu and Ken Yamada interviewed George about his camp band experience, which sparked his interest in researching other camp bands that culminated in the publication of his book, “Reminiscing in Swingtime: Japanese Americans in American Popular Music, 1925-1960.” Published in 1997 by the National Japanese American Historical Society (NJAHS) in San Francisco, this seminal work is the primary reference on the subject and is included in college and university curricula. In 1989, George and Mark co-founded the J-Town Jazz Ensemble to perform the music of the World War II era that constituted most of the repertoire of the camp bands. In 1994, Paul Yamazaki, co-founder of the Asian American Jazz Festival, interviewed George for the Smithsonian Institution Jazz Oral History Program. In 1998, George and Tsuyako “Sox” Kitashima (who gave congressional testimony about the internment experience) served as the principal advisors and consultants for “Jazz & Justice: Big Bands Behind Barbed Wire,” a federally funded, multimedia touring program designed to educate the national public about the Japanese American internment experience. The Asian American Jazz Orchestra (AAJO) was founded as a cultural component of this program and George can be heard recounting his camp memories of the “Last Dance” on the AAJO’s 1998 recording “Big Bands Behind Barbed Wire” (Asian Improv). This film is currently being broadcast locally and nationally on PBS stations to celebrate Asian Pacific American Heritage Month. There will be a members-only reception and screening of “Don’t Lose Your Soul” on Wednesday, May 28, 6 to 8 p.m. at the Ninth Street Independent Film Center in San Francisco (www.ninthstreet.org), where George Yoshida will be honored. More information will follow. George Yoshida will be remembered by all for his humanity and humility, his gracious manner, his generous heart and his musical soul. We members of the Asian American Jazz community are especially indebted to George for his mentorship, perseverance, and inspiration, and I believe all who knew him are truly grateful to George for making the world a better place. Anthony Brown, Ph.D. (www.anthonybrown.org) is a Smithsonian associate scholar and director of the Grammy-nominated Asian American Jazz Orchestra. This article originally appeared in The Nichi Bei Weekly.